We discovered Glamaholic magazine indirectly via the most recent Tarina Tarantino newsletter. This particular newsletter highlighted that the Magic Mirror line was seen on Kelly Osbourne, but Tarina Tarantino did almost all the accessories for the Glamaholic anniversary issue cover shoot, starring Kelly Osbourne and shot by photographer Michael Freeby. It is always exciting to find an appealing new magazine to read. 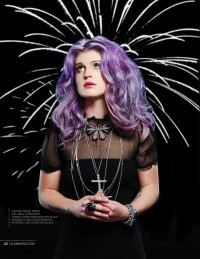 Kelly Osbourne looks beautiful and it is a very nice cover shoot. From an alt fashion perspective, it is sort of unsettling that now she looks like a regular chick who is just discovering cool style, when, because we know it is Kelly Osbourne, we know the trajectory is actually in the opposite direction and this is a cleaned up fashionista version of her previous punk and metal looks. Big clunky jewelry, black clothing, and purple hair are always good, no matter what. Scroll down for a cool behind-the-scenes video of the cover photo shoot. Arriving in Paris during the 20’s, Art Deco and its geometric exuberance presented a luscious and optimistic view of art and culture. Art Deco is heavily inspired by Cubism and Futurism, as well as Egyptian and Aztec composition. Tarina takes this complex confluence and refines it into one of her most classic collections to date. The Magic Mirror Collection uses stampings and vintage elements actually struck on equipment operating in the 20’s and 30’s. This moving and complex tribute to the pure decoration of the time is modernized with rare volcanic glass beads, high-tech fiber flocking, mirror-plated crystals, and cutting edge hematite electroplating. Kelly Osbourne graces the First Anniversary cover of Glamoholic magazine. Go behind the scenes of Kelly Osbourne’s Glamoholic cover shoot with photographer Michael Freeby. Video by Byron Atienza, Music by Dave Melillo. Posted by Gothic.org on November 30, 2012. Filed under Headline, Images, Jewelry, Style Icons, Zines. You can follow any responses to this entry through the RSS 2.0. Both comments and pings are currently closed.